Why Govberg for Hublot Repair? When every second counts, choose Govberg Watch Repair to service your fine Hublot watch. Fill out the form on the right to get started with your FREE Hublot Repair Estimate. Your service was very good. I received my Hublot faster than quoted to me. Received my Hublot today in great shape. Thanks! Received my Bulgari watch back and I must say you guys did an excellent job. I really appreciate the attention given to me and the quickness at which this job was completed. Couldn't be happier. Thank you very much. Received the Omega watch in great condition. What a professional job!! Thanks! Watch came out amazing! The mechanics and accuracy are better than it was when it was brand new. I just received my watch and it looks great and runs well too! Thank you. Thank you for your prompt repair and communication throughout the repair process! I thank you for your service. my watch looks like new. You seem to be doing everything right. I'm satisfied and well pleased. 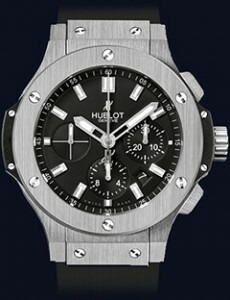 Since its debut in 1980, Hublot has enjoyed much success thanks to the bold and unconventional styling of its timepieces. After three years of research, the watchmakers at Hublot unveiled the industry’s first completely natural rubber strap, which by years-end proved to be a commercial success. To date, Hublot has received several awards including design honors and watch of the year awards at two separate ceremonies. Their most popular model, the Big Bang, is one of the most iconic modern watches available today. Hublot produces watches with a wide range of case materials ranging from carbon fiber to watches completely dressed with diamonds, and everything else in between. With partners including Ferrari, European football teams, museums and more, Hublot’s interest and participation within the community knows no bounds. Nothing is more important than ensuring your Hublot wristwatch is running to original factory specifications. To guarantee this, routine maintenance is a necessity. At the Govberg Watch Repair center, all forms of maintenance ranging from the basic factory service or bracelet replacement to a complete overhaul of your watch’s entire movement is available. Performed by watchmakers trained to exceed the industry’s highest standards, our in-house experts are certified to service your Hublot and they will do so in an efficient and reliable manner.